In the II millennium BC. on the territory of Central Asia the Indo-Iranian tribes appeared, they came here from the south-west. Later these tribes settled on the territory of Khorezm (to the south of the Aral Sea and along the Amudarya river) and Sogd, or Sogdiana (in Zarafshan basin and its surroundings). In the 4th century BC. after the campaigns of Alexander of Macedon in the south of the present territory of Uzbekistan the Greek influence established. The intensive development of trade concerns approximately by the same time. One of the three main caravan routes of the Great Silk Road laid across Central Uzbekistan and the Fergana Valley. The spreading of Islam. The Turks and the invasion of the Mongols. Since the end of the 7th century the Arabs raided Sogdiana, and in the 8th century the systematic conquest of Central Asia by the Arabs began. By the 10th century the whole territory of Transoxiana (the regions between the Amu Darya and Syr Darya rivers) had become Islamic. The Persian dynasty of the Samanids established in Sogdiana, and the Amu Darya delta remained under the authority of Khorezm. In the 10th century the Turkic tribes of Transoxiana joined and their rulers, who converted to Islam, formed the dynasty of the Karakhanids. At the end of the 10th century Samanid state was conquered by the Karakhanids. In the late 12th century Khorezm increased and subdued a large part of Central Asia. By that time, mainly the process of forming the Turkic Uzbek nationality was finished. At the beginning of the 13th century the Mongol armies of Genghis Khan encroached on the territory of Central Asia. The cities were left by the residents, and the ruined people went back to the nomadic way of life. The Timurids and the period of the Khanates. At the end of the 14th century the power over Central Asia passed into the hands of one of the Turkic leaders - Timur, known as "lame" (Timur -Leng, Tamerlane in the European pronunciation). His possessions with the capital in Samarkand stretched from China to the Middle East. Timur crushed the Mongol and Tatar Golden Horde, protected the Muslim religion and art; during his governing many of the famous architectural ensembles in Central Asia were built. After Timur’s death (1405) the dissensions for power among his heirs, the Timurids, began, accompanied by the popular tumults; all this undermined the power of Transoxiana. After the death of Timur’s grandson, Ulugbek – the scientist and educator, the nomadic Turkic tribes, known as the Uzbeks, invaded from the vast northern steppes. These tribes were assimilated with the local settled population, having given its name to it. By 1510 their leader Sheibani Khan, conquered almost the whole country, driven out of the Timurids. In the 16th century two grate khanates were formed on this territory. The larger of these, with its capital in Bukhara controlled the central, southern and eastern parts of the territory of modern Uzbekistan. Another, Khiva Khanate with its capital in Khorezm, occupied the Amu Darya delta and adjoining areas. Later, in the 18th century, the third Khanate was formed, the political center of which was Kokand (the Fergana Valley). The period between the 16th and 19th centuries was marked by the decline, due to the internecine strife between the khanates, the raids of the nomads and cutting trade along the Great Silk Road. Uzbekistan is under the authority of Russia. In the 17-19 centuries the Russian gradually extended their influence in the steppe regions north and east of the Syr Darya, and in 1860 invaded Transoxiana. By the beginning of 1870s the Kokand Khanate was annexed to Russia and became a part of the Turkestan Governor-Generalship with its center in Tashkent. Bukhara and Khiva Khanates acknowledged the vassalage from Russia. At first, the Russian administration did not intervene in the cultural and religious life. However, the development of industry required changes in the economy of the region, the cultivation of cotton crops took the central place in agriculture to the detriment of other crops and cattle-breeding. At the end of the 19th century the group of Central Asian intellectuals - " the Jadids ", began looking for ways to overcome the economic and social backwardness of the Uzbek people. The growth of national consciousness of the population under the direction of the Jadids led to mass actions and rebellions. In response, the imperial government tightened the political control in the region and interfered in local customs and culture. During the First World War, the Russian army suffered heavy losses at the front, and in summer, 1916 the Russian government issued a decree on the mobilization of Muslims in the army to rear works. This edict caused a large-scale uprising in Central Asia. During the uprising and its suppression many thousands of people died. 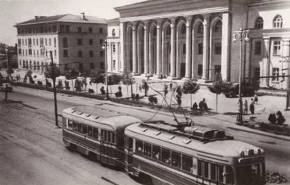 Tashkent, the residence of the colonial administration, was the center of the revolutionary events of 1917 in Turkestan. The provisional government, which replaced the autocracy in February 1917, showed no desire to allow the Muslims to participate in the political life of Turkestan. The Bolsheviks promised to put an end to the national oppression. The Soviet period. In November 1917, the Muslim religious leaders gathered the Extraordinary Congress in Kokand, where they declared about the autonomy of the southern part of Central Asia. However, in February 1918 "Kokand Autonomy" was defeated by the superior forces of the Red Army, sent from Tashkent. The severe suppression of Kokand led to a reciprocal Basmachi movement who fought against the Bolsheviks in various regions of Central Asia. In April 1918 the governor-generalship of Turkestan was reformed into the Turkestan Autonomous Soviet Socialist Republic (ASSR). With the help of the Red Army the previous government in Bukhara and Khiva was overthrown, and Bukhara and Khorezm Republics became parts of the Turkestan Autonomous Soviet Socialist Republic. In October 1924, new "national" administrative units were introduced; one of them was the Uzbek SSR. From 1924 to 1929 Tajikistan exercising the rights as the Autonomous Republic was the part of the UzSSR. Originally, the capital of Uzbekistan was Samarkand, but in 1930 the capital was moved to Tashkent. The Adoption of the First Five-Year Plan in 1928 was the beginning of a broad assault on the traditional economic structure, and culture of Uzbekistan. Collectivization, which was preceded by land and water reforms, assumed a mass character in the late 1929; by the spring in 1932 three quarters of the land holdings in Uzbekistan were socialized and included in the collective farms. Uzbek writing was changed from Arabic into Slavic graphical base, it was followed by the campaign to overcome illiteracy. The formation of Uzbekistan was accompanied by the Republican organization of the Communist Party and governmental establishment. The first chairman of the Uzbek government (Council of People's Commissars) was Fayzulla Khodjaev, the former jadid from Bukhara. In 1924 V.I.Ivanov was appointed the first secretary of the Communist Party of Uzbekistan. However, in 1927 he was replaced by Akmal Ikramov. Khodjayev and Ikramov retained their positions until 1937. At the end of 1920s – beginning of 1930s, the number of members of the Communist Party in the country increased rapidly, with a simultaneous increase of Uzbeks among party members. By 1934 64% members of the Communist Party of Uzbekistan were Uzbeks. However, the party ranks greatly thinned out as a result of Stalin's repressions. The victims of party purges became many members of Uzbek party and economic elites, especially those who, like Ikramov and Khodjaev, were once closely connected with the Jadids. Ikramov and Khodjayev were sentenced to death at the last show trial, which was held in Moscow and they were executed in March, 1938. The most significant figure in the postwar Uzbekistan became Sharaf Rashidov, who was holding a post as the first secretary of the Communist Party of Uzbekistan for 24 years (from 1959 to 1983). With coming to the leadership of Islam Karimov, the formation of a new policy, focused on national interests of Uzbekistan, appeared. Karimov began to follow the more popular policy among the population in the sphere of religious, cultural and economic life, social welfare and protection of the interests of Uzbekistan. In August, 31 at the VI extraordinary session of the Supreme Council the political independence was proclaimed. 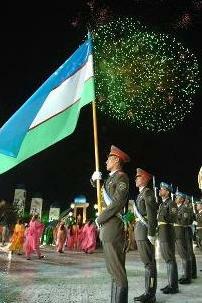 The country received the name - the Republic of Uzbekistan. The 1st of September was declared Independence Day - national holiday. In March 2, 1992 at the meeting of the UN General Assembly the Republic of Uzbekistan was admitted to UN.